Last fall my friend gave me a “garden warming” present of a shrub that she noticed I had liked when we visited a nursery together. At the time, it was about 4 feet tall and have lovely dark berries on it. I had been asking about shade-tolerant shrubs, and the nursery owner pointed toward the “shady zone” where I noticed this shrub. 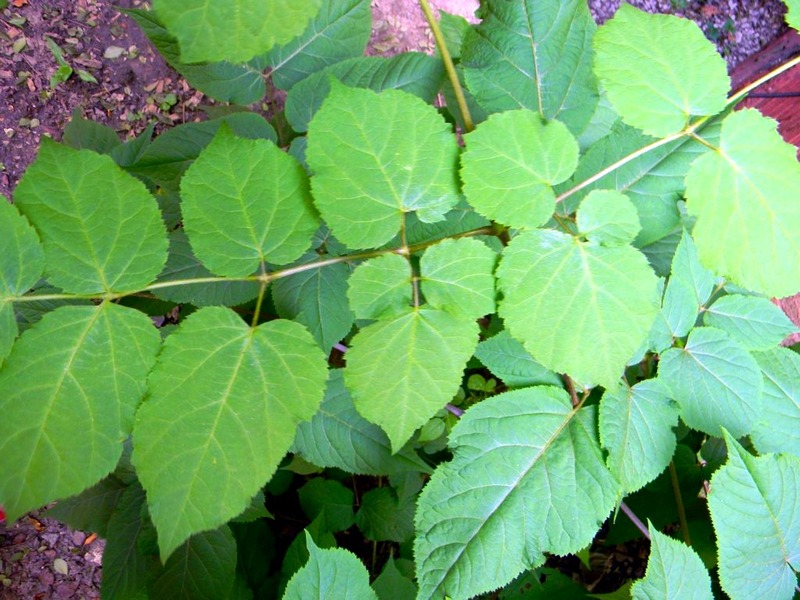 Aralia spinosa, otherwise known as Devil’s Walking Stick, went into the ground in a very shady spot near our house, partially underneath an enormous (18 – feet tall and out of control) Forsythia. What to do with that particular beast is another post for another day! Last fall the Aralia spinosa lost all of it leaves and I honestly couldn’t tell if it was living or going dormant or what. I did a little research and although I wasn’t 100% positive I was supposed to, I pruned it down – pretty much all the way to ground, leaving just an inch or two above the soil so that I could see where it was planted. This Spring it came up in full force, and actually it appears to have two main “stalks.” I cannot believe how much it has grown and how full it has leafed out. I’m a little afraid because the info I’ve found on the internet suggest that I’ve got myself a real TREE, here, with the possibility of it growing up to 20′ tall. Yikes. If this year’s growth is any indication of just how quickly this thing can move, I believe it. Perhaps if I prune it to the ground each year that will keep it in check? I’ll see what it does this year and think about if I need to move it to another spot or not. I’m hoping it will produce those lovely berries this fall and that they might be appealing to birds. Hard to tell from the photo, but it’s at least 3′ tall and easily 3′ in diameter. It didn’t flower at all this spring, just went straight to leafing out. Our garden areas are relatively small, so I’m a bit worried about this one taking up too much space or competing with other things I’ve planted. This is definitely one to watch this year. I’m curious to see how much more it will grow and whether or not the birds like the berries. Garden space is at a premium here, so I feel that a plant really has to prove itself to be worthy of taking up the space here! Right now I appreciate the quick, lush growth and show of green in an area that not a whole lot of other plants could tolerate because it is so darn shady. We shall see, Devil’s Walking Stick….we shall see! 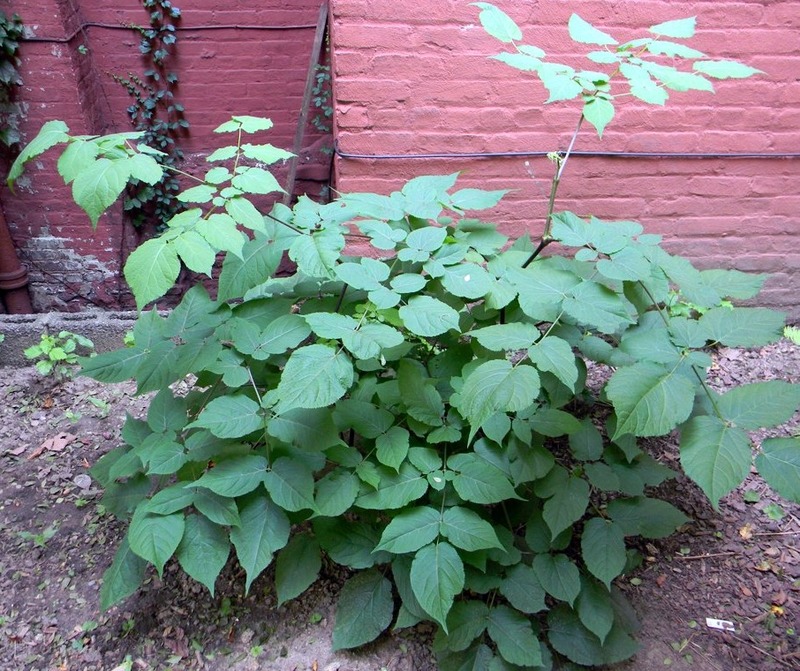 This entry was posted in Perennials and tagged Aralia spinosa, Devil's Walking Stick. Bookmark the permalink. One photo shows a spray of purple berries that are very attractive. You may still get the flowers and berries. Avoid pruning the branch tips this season. I was trying to learn if bloom occurs on new wood or old wood, but could not find that info. I have never seen this tree in person. Michael Dirr is majorly famous among tree and shrub lovers… I have seen him on TV many times, often in magazines too. College professor, beloved expert, respected author. He also works on developing/improving new cultivars of shrubs. Wow – thanks, Bev! This is great information to have. Needing to be “restrained to prevent rampant spread” scares me a little, but I’m glad to hear that it is generally free of “pestiferous nuances,” which is on the fast track to becoming one of my new favorite phrases. Thanks, Dr. Dirr! I am glad to hear that I may expect some flowers and hopefully berries too. So far my shrub seems completely prickle-free, so I hope I’ve been given the right name / information regarding this plant! We’ll see what happens! I’m hoping it will be a nice addition and work well in our garden, especially since it was not an inexpensive gift and since it was from a good friend…but it will indeed have to pass the test! This site http://www.shaman-australis.com/forum/index.php?showtopic=25175 and a few others claim that it has been used in making root beer! Oh wow, that sure is a prolific grower. Space here is also at a premium, so I like to pull things that I don’t want to keep. Maybe you can keep it in check if you prune it down every year like you mentioned. Question for you, do you know of any other shrubs that love shade that doesn’t grow so large? Hi Mimi, yeah, I’m hoping that pruning will keep it in check. She is a great resource when it comes to shade-loving plants, plus she has a nursery where she sells plants – in PA, but not terribly far from NYC. Check her out or send her a message! I’ve only seen Devil’s Walking Stick at a nursery when it had no leaves, very thorny if I remember right. I’ll be interested to see what the berries look like, I really like the leaves on it.